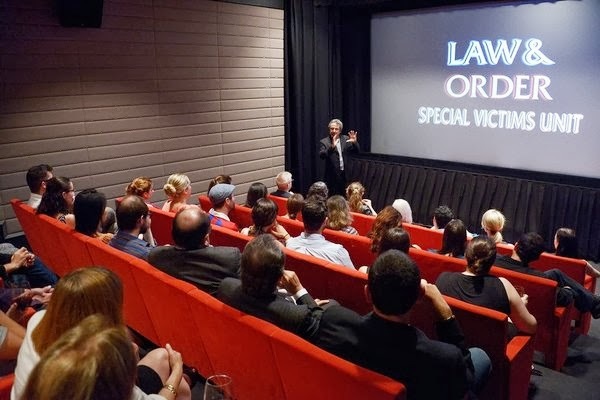 NBCUniversal, Wolf Films and Mariska Hargitay hosted a private screening of the 15th season premiere of "Law & Order: Special Victims Unit". 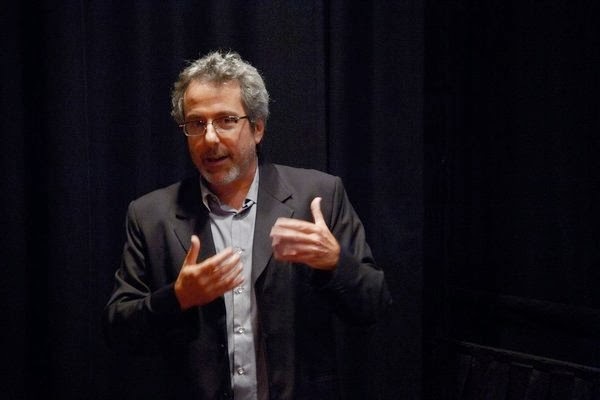 In attendance were Executive Producers Warren Leight and Julie Martin, Mariska Hargitay, Richard Belzer, and Danny Pino. Also in attendance were Alec and Hilaria Baldwin. Photos by: Michael Loccisano/NBC © NBC Universal, Inc.
Can't wait for the premier on 9/25- but did Mariska pick her dress to blend in perfectly with the chairs and the screening room ?She chose perfectly! 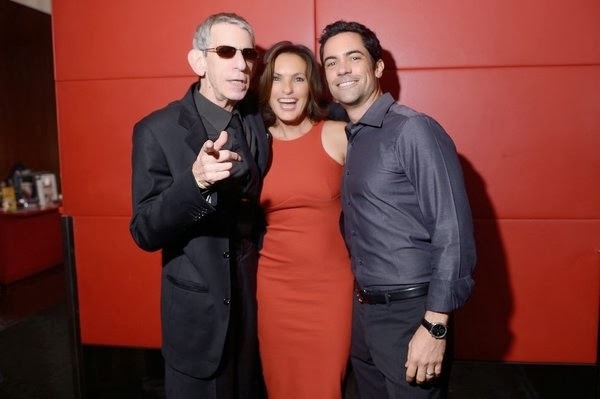 lol..Mariska never blends into the background! I mean no offense to Mariska but I call those "fat" dresses. The black sides and the colored center are supposed to be slimming, the black causing the eye to only look at the colored (and shaped) center, which is smaller that the overall dress itself. The matching of the background was also done on purpose for the same reason, it is supposed make the black sides of the dress to look more like a shadow than highlighting the body size. These dresses are getting so common for that reason that the person might as well wear a sign saying they are overweight. I would never be caught dead in a dress like this. Mariska looks lovely as she is, but probably she is carrying the a little more pounds than she should. Again, this is nothing against Mariska, it's a fashion slight of hand with the dress. I'm carrying a few extra pounds myself (not overweight, though) so I have mo room to criticize her weight. I think Mariska looks very pretty and very happy in these photos, and she is NOT overweight. 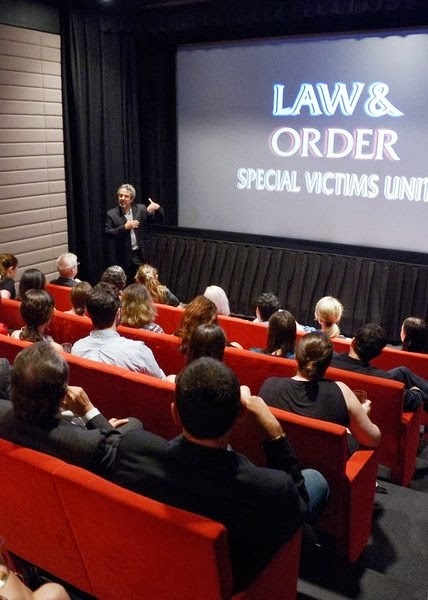 No Kelli Giddish, Dann Florek,Raul Esparza at the screening?? I love the relationship Mariska has with her friends and co-stars. She's so sweet and they genuinely love and adore her. With all due respect, you're totally wrong. Mariska is many pounds thinner than season 14. This dress shows off her curves and her wonderful body. Love the dress and Mariska used to show exactly what is in fashion. Can't believe people are focused on her dress when I keep having to tell myself it's just television and not real because i'm so worried about Mariska (Olivia) getting tortured and possible raped . She beautiful and looks good anyway . I think Mariska looks stunning in these photos. I'd be happy to look half as good as she does at her age. Anyway, why do people have to comment on someone's looks and weight all the time. It's rather boring. I couldn't agree more that Mariska looks very healthy and fit compared to even a season ago. You can tell she's put a lot of effort into healthy eating and exercising in order to keep up the demands of a very active busy life. I admire Mariska tremendously. She's proof that a woman of any age can become a wonderful role model.You never hear the slightest negative comment about her private life, her work,or any hint of scandal with her. If only so many of these young actresses/singers lived their lives as well. They could learn a lot from her as a role model. I can only agree with everything you say. Mariska is an example and an inspiration. 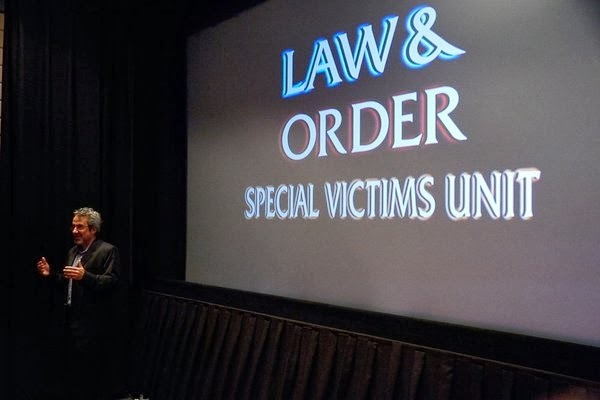 In my country, it is simplesmenter adored by fans of SVU. I miss Ice, Kelli, Dann & Raul in these photos. That would have made them perfect. What an incredibly unnecessary thing to overanalyse Catfish 92. She probably wore the dress because she liked it. Does it matter? She's a beautiful woman we all admire. I don't see how the pictures above or this blog post warrants any kind of discussion about her weight? She looks happy to be there, and she sounds excited to get to do this show for another season and to get to experiment with a slightly updated concept. I am thrilled that she appears to be in a place where she is really comfortable and excited and challenged all at the same time. I can't wait to see what they have in store for us this season. I'm not over analyzing Malin, just responding to a comment made about the color choice of her dress. And it is a valid comment. These types of dresses are designed and marketing to give a slim and minimizing appearance. I see them in use all the time for women in television news. I think the color choice was intended to blend her in. Women who are already slim don't wear these dresses. As I stated in my first comment, I meant no offense to Mariksa. My comment was more directed to why women continue to wear these kind of dresses when most women know what they are designed to do. As a related comment, when I saw the new cast photos, I was shocked at the amount of photoshopping done on Mariska's face and the rest of the cast. It is as if either they are ashamed of their ages or the publicity people are. 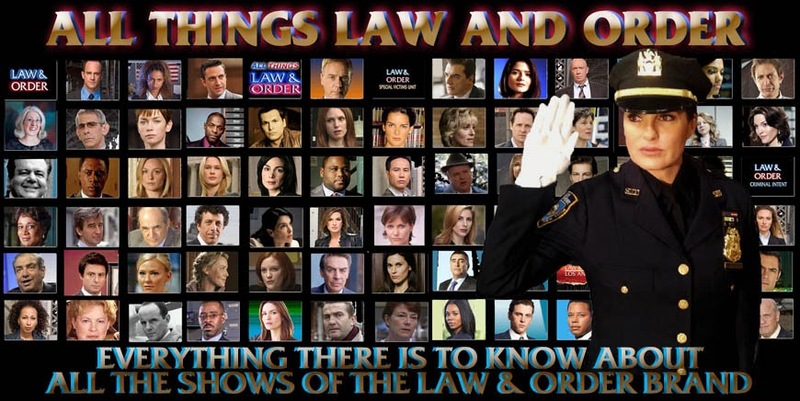 Fans of Mariska should be outraged that they photoshopped her face so much. In fact, they all look like plastic figurines. It's hard to tell anymore what people in TV really look like, as their photos are so touched up and they have pounds of makeup on and special lighting on the shows. I think what you reference is a shadow.